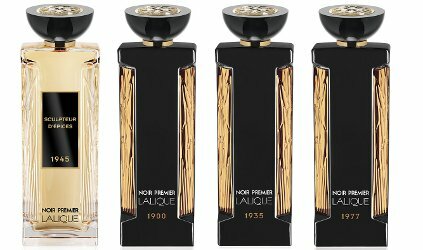 Lalique has launched Lalique Noir Premier, a new luxury collection of six fragrances: Fleur Universelle, Terres Aromatiques, Rose Royale, Sculpteur d'Epices, Fruits Du Mouvement and Elegance Animale. Lalique Noir Premier is an exclusive collection of outstanding fragrances. Lalique asserts its timeless character, whilst creating bridges between past and present. Fleur Universelle (1900) ~ "Noir Premier Fleur Universelle is a fragrance based on the immortal Everlasting Flower, a flower with a unique power of renewal and a capacity to endure throughout time. The chypre scent equally evokes past and present, and blends memories into an incredibly modern, addictive and warm accord." The notes include pink pepper, rum, cardamom, everlasting flower, myrrh, cinnamon, patchouli, tonka bean and lorenox. Terres Aromatiques (1905) ~ "In 1905 Rene Lalique met François Coty. This relationship resulted in beautifully designed perfume bottles and the modern perfume industry was born. This fragrance respects influences, in Coty's creations, from the land and environments of Provence and Corsica. An outstanding woody aromatic accord highlighting thyme." Additional notes include cardamom, lemon, pineapple, lavandin, freesia, vetiver, tonka bean and orcanox. Rose Royale (1935) ~ "Rose Royale celebrates the grand opening of the Lalique flagship boutique in 1935, located at Rue Royale in one of Paris' most exclusive areas. This beautiful floral fragrance, with woody, leathery notes, stars rose and osmanthus for a sensuous yet elegant accord." Additional notes include peach, apricot, cashmere wood and musks. Sculpteur d'Epices (1945) ~ "Sculpteur d'Espices [sic] was created solely for Harrods. It was in 1945 that Marc Lalique, succeeding his father, turned to the art of crystal-making. With the know-how and will, Marc Lalique was driven to innovate what would become the house’s trademark: the contrast between transparency and satin finish - Sculpteur d’Épices, honours the legacy of these two sculptors of light. In the opening, bergamot throws a sparkling light on an intensely faceted pepper. The fragrance is bolstered with cinnamon, while pepper adds vibrancy to the heart notes, enriched with the florals of rose and jasmine absolutes. In the base notes, Sculpteur d’Épices smoulders in the amber glow of a labdanum, tonka bean and patchouli accord." Fruits Du Mouvement (1977) ~ "In 1977, Marie-Claude Lalique took over the company and made the wind of modernity and femininity blow over Lalique creations. She renewed the designs, bringing bright colours and her innate sense for movement. An artist and a sculptor for her first crystal creation, representing a dove, she bought a live animal to study it and recreate its movements. This is a refined, floral fruity scent, in which a fruity note of prune changes into opulent jasmine and comfortable woods in a subtle move." Additional notes include black pepper, ginger, mandarin, cashmeran, amber and sandalwood. Élegance Animale (1989) ~ I will update with a description when I can! Update...the notes are saffron, peach, geranium, rose, jasmine, gurjum, leather accord and sandalwood. The Lalique Noir Premier collection can be found now at Harrods in the UK, in 100 ml Eau de Parfum, £180 each. SIX new fragrances and I don’t see a single one with OUD in the note list. Can that be true? Opps, I see one that isn’t listed yet, I hope I haven’t put the whammy on it. You read my mind! My first thought was, “Oh, Noir — they probably all have oud in them.” Then as I was reading the descriptions, I thought, “Well, ONE of them obviously has to have oud.” But no! However, at £180 each, I’m not interested, so it doesn’t really matter what’s in them, does it? Probably not going to matter for me either. Several of these sound very intriguing. They do. We’ll see, I don’t have a ton of favorites from the line. Fruits of Movement? Guess it lost something in translation.